Following on from my previous post, here’s another poem using circles. The poem started out life as a haiku but I like the new line breaks and rhythm. Time for a little experiment. I decided that I would assign a colour to each letter of the alphabet using the range of a rainbow. So, starting with Red as A, moving through to Violet as Z. And to show you what that looks like, here’s a pretty little picture of it. Now, some people might say that I need to do a bit more work on the blending. And they’d be right. But for the sake of expediency, you’re stuck with the above. Next, I took a poem. Actually it’s a haiku. No point getting too ambitious. 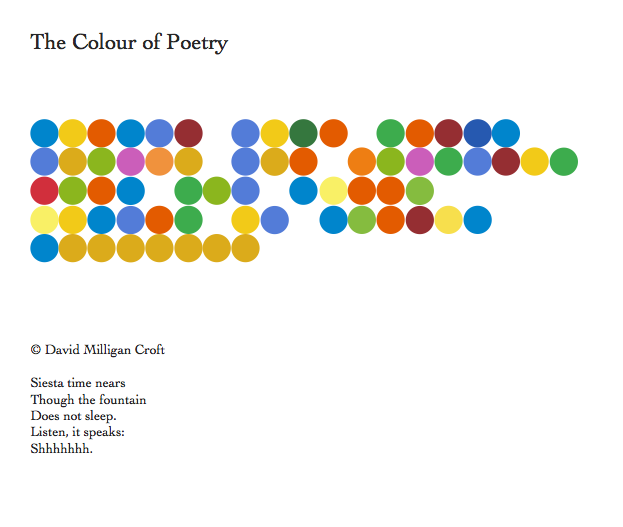 I wanted to see what my poem would look like purely as colour. I think it looks kind of pretty in an abstract kind of way. Of course, you wouldn’t just have to use the colours of the rainbow. You might want to try it using only hues of red and orange. You could also vary the shapes. If it doesn’t take the art world by storm MI6 could always use it as code.